Is it possible to make a professional mix at home? If you read the question above, you probably have one of two reactions. Which category do you fall into? Seriously. It makes a huge difference. Your mindset can make or break your next project. I tend to fall firmly into the second category. Yes, great gear is awesome. A perfectly treated room is a killer luxury to have. But are they prerequisites for pro mixes? Nope. Skill, talent, ablity — these things will always trump fancy equipment. Great equipment makes the job easier, but only if you already know how to use the gear. I could put a 15-year-old kid, fresh with his learners’ permit, into a Maserati. Will he be able to back it out of the driveway and get it down the road? Hopefully. But will he REALLY know how to drive that car like it’s meant to be driven? Nope. I played golf the other day for the first time in a long time. I dug my crappy clubs out of the back of the shed, dusted off the cobwebs, put on my shoes (NOT golf shoes), and headed to the course. I refuse to buy nicer clubs until I’ve proven that I can get decent results with these really old clubs. A brand new driver would just mean my bad shots go farther out of bounds. It’s kinda the same with gear. Hand Tiger Woods my sad set of clubs, and he’ll work magic. Hand Dave Pensado a cheap interface and stock Pro Tools plug-ins, and I bet he comes up with something awesome. It’s the gear between the ears that has the biggest impact. Will you have obstacles in your home studio? Absolutely. There are a lot of things working against you. Less-than-awesome gear for one. Bad acoustics is another. They make it difficult to get pro results…but not impossible. You can push past these obstacles and get great results. So, the answer is yes. You can get pro mixes at home. “Pro” is such a vague term anyway. If the client is happy with the mix, then it’s “pro.” If you’re happy with the mix, then it’s a pro mix. Keep working at it. 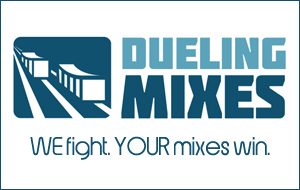 If you want to hear my home-made album, recorded and mixed in my home studio (and if you want to practice mixing it yourself), then check out Mix With Us. Do you agree? Can you get a pro mix at home? Leave a comment below. It’ll take 30 seconds. Go!